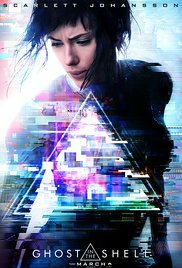 GitS has modified the plot of the original, which I think is fine. If you're remaking a film as brilliant and successful as the 1995 GitS, there is no point in doing exactly the same thing over again. Major now has more of a backstory. The operation to place her brain in an artificial body damaged her memory, and much of the action is driven by her wish to discover her past. Needless to say, the corporation which made her cybernetic body has not told her the whole truth. Early in the film, she is given to taking extreme risks against the orders of her superiors; this may indicate frustration at her loss of memory, or even an urge towards self-destruction. Much of the ambiguity and mystery of the original has been put aside, in favour of a more straightforward plot with an antagonist out for revenge. Again, I think this is all right; it's not as subtle as the original, but does what it sets out to do efficiently enough. Along the way, it grapples with questions of memory, identity, and the boundary between human and machine. There is a repeated motif of consent to data modification, which parallels today's concern for security of our personal and genetic data. The action scenes are well done, and the production design does a good job realising a grimy, futuristic world somewhere between Blade Runner and The Fifth Element. As a spectacle for the eyes and ears, this film is pretty good; philosophically, it falls a bit short. GitS badly wants to be Blade Runner; it's not that clever and ground-breaking, but very few films are, and I give it credit for ambition. I was a little disappointed with the ending. Giving Major more of a past and inner conflict could have provided greater emotional depth than the original, but it didn't take full advantage of this chance. Even at the very end of the film, Major seems detached from the events around her. She's been through traumatic events and discoveries which would have, sooner or later, caused a normal person to break down sobbing; but at most she looks mildly disgruntled. Of course, Major is by no means a normal person. It's unclear how much of her memory has returned. She doesn't even have a human endocrine system --- she's missing glands and hormones, and may not be physically capable of producing tears in response to sadness. It's not unreasonable for her to go through life in a detached, coldly rational way. However, Major encounters a person from her past, who has a full complement of viscera and emotional responses. This person is able to comprehend the horror and pathos of what Major has become, and what she has lost, even if the Major herself no longer can. In Terminator 2 -- a crowd-pleasing action movie if ever there was one -- John Connor expresses the emotions the Terminator cannot feel. This character could easily have served the same function, but it's a missed opportunity, as the human displays little more feeling than the cyborg. I suspect the filmmakers just didn't have the nerve to go there. They wanted to end on a note of spectacular action, not regret and loss. Death and dismemberment are fine, but feelings are icky and probably have girl cooties. Despite these flaws and limitations, GitS is an enjoyable enough movie. If the 1995 original had never existed, we might think of it more kindly. As things are, it suffers by comparison, but it's still a well-made and relatively thoughtful action film. Now I'd like to say something about the film's treatment of race. I'm trying to be careful here, because I realise this is a sensitive topic, and I'm a white person without first-hand experience of racism. What follows is my personal opinion, based on the current state of my understanding. I hope it may be useful or at least interesting. I think there are issues of character and setting at work. The latter is important, and widely overlooked in favour of strong opinions for or against Scarlett Johansson. Just to get this out of the way, Johansson is very good at playing an inhuman badass and does a perfectly fine job; but she's arguably the most in-demand female actor in the world, and would not have suffered any hardship if the role had gone to someone else. Consider Idris Elba's portrayal of the Norse deity Heimdall in the Marvel films. The Norse myths originated with pasty white Scandinavians, and Elba is anything but. What's the difference between casting a black actor as a character from European source material, and a white actor as a character from Asia? The question pretty much answers itself. Scandinavians, and white people more generally, are not under-represented in the media. This is not so for people of colour. At the top end of Hollywood, Asians have it even worse than black people; there is no Asian equivalent of Will Smith or Denzel Washington. In a perfect world, actors would be cast independently of skin colour. We do not live in that world. GitS was a rare chance to break open the hidebound conservatism of Hollywood studios, and cast an Asian as a blockbuster action lead. It could have paved the way for other Asian actors, much as Sidney Poitier did for the likes of Smith and Washington. To say the least, it's a missed opportunity. All this is exacerbated by the film's setting. Remakes like The Ring and The Departed transplanted Asian films to America. The cops and crooks in The Departed are not Asian, because it centres on an Irish-American gang in Boston. Martin Scorsese could have set The Departed in Hong Kong or Vancouver, kept the Chinese Triads and cast Asian actors, but that's not the story he chose to tell. The Departed does nothing to advance the cause of Asian representation in Hollywood; but in and of itself, I don't think that makes it a bad film. If GitS was set in, say, San Francisco, its mixed white and Asian cast would be a lot less jarring. Instead it takes place in an unnamed city with mostly Asian architecture and population. Filming locations were in Hong Kong and Shanghai, but characters speak Japanese and the head of government is "the Prime Minister". We have the incomparable 'Beat' Takeshi Kitano as Major's boss, but other authority figures are largely white. Meanwhile, criminals and prostitutes are mostly cast as black or Asian. The whole thing has an uncomfortable echo of European colonial rule. Last but not least, it turns out Major's original body was Asian; placing her brain in a white cyborg body takes colonialism to a whole new level. To be fair, the film does not see whiteness as necessarily good. The white authority figures are mostly bad guys. I'm not really spoiling here; one in particular might as well have a neon sign over his head reading "villain". Similarly, Major's change is portrayed as a violation. She has a powerful new body, but at a terrible price; and she finds peace only by discovering her past identity. As I've noted above, GitS doesn't quite have the courage to dwell on this as it deserves, but it at least acknowledges the issue. GitS is a story of heroes, some of them Asian, fighting a white villain in an Asian setting. This is not a get-out-of-jail-free card by any means. The film's approach to race is, at best, rather clumsy and careless. I know at least one person who believes it goes too far to be watchable, and I'm certainly not saying he's wrong. My personal opinion is that GitS is doing something intelligent enough to be worth seeing, without overlooking or excusing its flaws. In fact, I think that's a fairly good summary of the movie as a whole. Postscript: The SF writer John Scalzi has some relevant thoughts on enjoying problematic works or artists.